WILSON, JAMES CROCKET, teacher, businessman, and politician; b. 19 July 1841 in or near Rasharkin (Northern Ireland), son of Samuel Wilson and Elizabeth Crocket; m. 6 Nov. 1865 Jeanie Kilgour in the Presbyterian church at Beauharnois, Lower Canada; d. 8 Oct. 1899 in Montreal and was buried two days later at Crescent Street Presbyterian Church. James Crocket Wilson was still a baby when in 1842 his parents emigrated to Montreal, where he grew up. 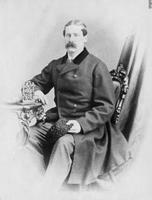 Despite the limited means of his father, who worked for the Grand Trunk Railway as a carpenter, he succeeded in educating himself with the help of a friend. In 1859, after studying at the McGill Normal School, he became a teacher in Beauharnois. But teaching did not fulfil Wilson’s ambitions. Attracted to business, he began working in 1862 as a clerk in a bookstore at Belleville, Upper Canada, and then was employed in a press agency at Toronto. It was in 1863 that he made his real entry into the business world, when New York publisher T. W. Strong hired him as a clerk. Wilson showed such efficiency and initiative that he was given increasing responsibilities within the company. In 1867, however, because his wife was homesick, the couple returned to Montreal, where Wilson obtained employment as a cashier and bookkeeper for Angus, Logan and Company, which manufactured paper. By 1870 Wilson thought he had gained enough experience and he was impatient to have his own business. With limited capital but strong support from his employees, he established a factory to make paper bags in Montreal. It proved so successful that he decided to build a paper-mill as a means of securing regular supplies at lower cost. Hence in 1879 he scoured the countryside around Montreal in search of a location. The little village of Lachute seemed ideal, since it was on a source of water-power, the Rivière du Nord, and also on the Quebec, Montreal, Ottawa and Occidental Railway line. Wilson quickly came to terms with the local authorities, who granted him the 20-year exemption from taxes customarily offered at that time, on condition that he put up his plant at the location indicated in his application by the agreed deadline and according to the stated plans and specifications. Wilson’s mill went into production early in April 1881 and two years later it ranked among the first in Canada for the production of manila paper. It then experienced rapid growth. The installation of a second machine in 1885 soon proved insufficient. The original mill was considerably enlarged between 1891 and 1893 and a third machine was installed in 1894, making the enterprise one of the largest of its kind in Canada. Around 1896 J. C. Wilson and Company controlled all the hydraulic power on the Rivière du Nord in the vicinity of the Lachute factory, and was thus able to bring a fourth unit into operation in 1900. In the mean time, Wilson had transferred his paper bag concern to Lachute in 1890. To guarantee larger supplies of raw materials, in 1893 he had bought the pulp factory in Saint-Jérôme set up by the Delisles (probably the sons of Alexandre-Maurice Delisle*) of Sainte-Cunégonde, then part of Montreal. By the end of the 19th century Wilson’s company was one of the largest paper manufactories in Canada. In addition to the mills at Lachute and Saint-Jérôme, it had a factory and warehouse in Montreal, as well as a branch in London, England. Wilson’s social life was that of the bourgeois of his time. He was a member of the Montreal Board of Trade, belonged to a masonic lodge, was active as a Presbyterian, and lent his support to cultural organizations and to numerous charitable causes. He was a life governor of the Montreal General Hospital. Wilson also tried his hand at politics. Having served on the Montreal City Council in 1880 and having been re-elected to it by acclamation in 1883, he represented Argenteuil in the House of Commons, as a Conservative, from 1887 to 1891. A man of wealth, he did not hesitate to display his success through such marks of affluence as his magnificent summer residence, perched on a height of land behind his mills at Lachute, from which he could admire the Laurentians and yet have the town at his feet. With the bourgeoisie of his day, Wilson believed firmly in the virtues of the family. When he died he left five children, including three sons ready to carry on where he had left off. ANQ-M, CE1–120, 10 oct. 1899; État civil, Presbytériens, Beauharnois, 6 nov. 1865. L’Événement, 10 oct. 1899. Monetary Times, 13 Oct. 1899. Montreal Daily Star, 9 Oct. 1899. Watchman and Ottawa Valley Advocate (Lachute, Que. ), 1879–99. Canadian directory of parl. (Johnson). Canadian men and women of the time (Morgan; 1898). Cyclopædia of Canadian biog. (Rose and Charlesworth), 2: 149–50. J. Desjardins, Guide parl. É.-J.[-A.] Auclair, Saint-Jérôme de Terrebonne (Saint-Jérôme, Qué., 1934), 105–6, 342–45. Hélène Champoux et Mario Nadon, Saint-Jérôme, en mots et en images; 150 ans de fierté, 1834–1984; album souvenir (Saint-Jérôme, 1984). J.-C. Lamothe, Histoire de la corporation de la cité de Montréal depuis son origine jusqu’à nos jours . . . (Montréal, 1903), 816–17. G. R. Rigby, A history of Lachute . . . (Lachute, 1964). Cyrus Thomas, History of the counties of Argenteuil, Que., and Prescott, Ont., from the earliest settlement to the present (Montreal, 1896; repr. Belleville, Ont., 1981). Serge Laurin, “WILSON, JAMES CROCKET,” in Dictionary of Canadian Biography, vol. 12, University of Toronto/Université Laval, 2003–, accessed April 26, 2019, http://www.biographi.ca/en/bio/wilson_james_crocket_12E.html.